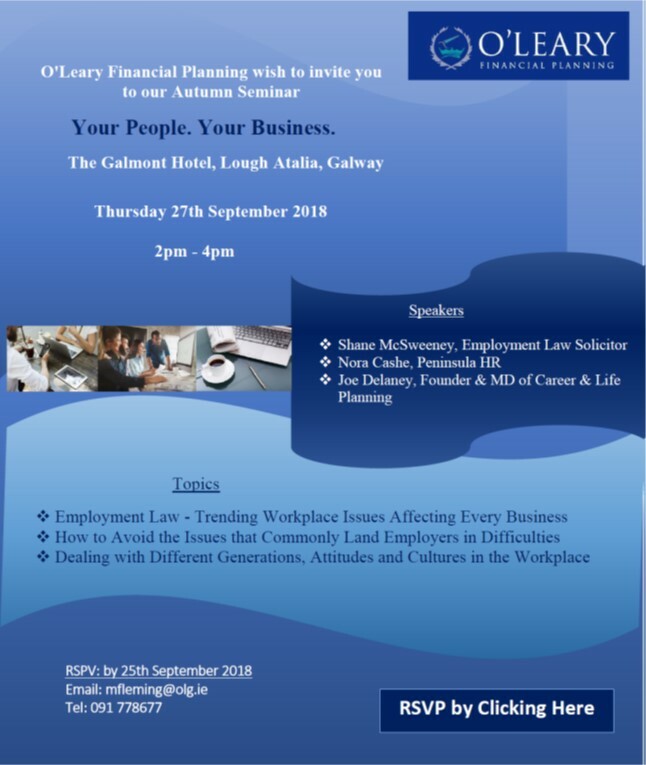 O’Leary Financial Planning recognises that as a business owner it can be hard to stay on top of the key employment issues affecting your business, so we’d like to invite you to our Employment Seminar on the 27th September. Takes place at the Galmont Hotel, Lough Atalia, Galway on Thursday 27th September 2018 from 2pm to 4pm. The 2 hour seminar addresses the latest workplace issues affecting every business and how to avoid those problems that often land employers in difficulty. In addition, dealing with different generations, attitudes and cultures can prove challenging for employers, so we take a look at how you can avoid conflict and create a more harmonious workplace environment.